The intimate relationship with God you've yearned for is well within your grasp—despite the chaos of juggling multiple roles, deadlines, and commitments in your stretched-to-the-max life. With Quiet Spaces, you can learn to calm your mind and listen for God's still, small voice in the midst of the tumult around you. 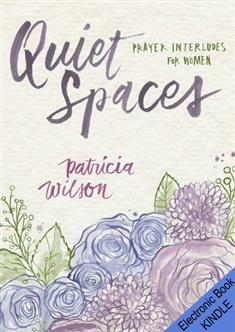 Author and former professional speaker Patricia Wilson knows what it's like to struggle with finding a few minutes for herself. Through Quiet Spaces she shows how even a few stray minutes can become a blessed opportunity for a focused encounter with God. On hold for a phone call? Waiting for an appointment? In traffic? The quiet spaces are all around you! Capture those 5-minute breaks and use them to touch the hand of God. You can find time to pray and connect with God—let this unique devotional book help you discover how.